A Concentration of Power aims to explore forms of power expressed in small scale. Images and objects that depict symbols, physical gestures and icons that suggest potency are presented alongside ceremonial objects and talismans created to achieve transformation though ritual and contemplation. Some of the objects and drawings are created with such focus and concentration that they appear to be imbued with their own latent power. Math Bass, Hawkins Bolden, Jenni Crain, Guy de Cointet, Matt Connors, Lucky DeBellevue, Florence Derive, Liz Deschenes, Shannon Ebner, Melvin Edwards, Vincent Fecteau, Denzil Forrester, James Hoff, Otis Houston Jr., Marc Hundley, Miles Huston, Shirley Jaffe, Caitlin Keogh, Elisabeth Kley, Wayne Koestenbaum, Siobhan Liddell, Magic Markings, Darinka Novitovic, Sanou Oumar, Matt Paweski, Bernard Piffaretti, Howardena Pindell, Charlotte Posenenske, Michael Queenland, Collier Schorr, Kerry Schuss, Amy Sillman, Allison Smith, Gwen Smith, Martine Syms, Tseng Kwong Chi, Karlheinz Weinberger, Frederick Weston, Martin Wong, B. Wurtz and Amy Yao. Beth DeWoody's Bunker, a 20,000-square foot building at 444 Bunker Road in West Palm Beach, will open as a place to exhibit her modern and contemporary art collection with a by-invitation reception Saturday December 2. 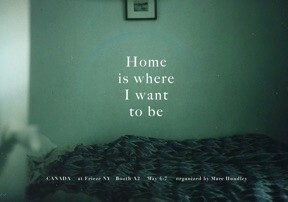 After that it will be open by appointment as a private exhibition space. For an appointment to see the art, contact sandra@brdart.com or call 582-4574. A gallery is a social organism. The Mitchell Algus Gallery opened in November of 1992 with an exhibition of Harold Stevenson's The New Adam (1962), now in the collection of the Guggenheim Museum. FOTG is the first of four exhibtions marking the gallery's first quarter century. It will be followed by three shows, of selected abstract, representational and conceptual work, in the new year. 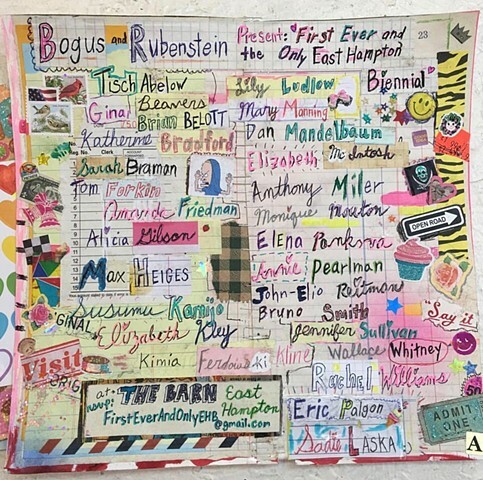 .... As colleagues with roots between New York and New England, these nine artists gathered represent a family of peers, each maintaining strong individual studio practices. They are informed as well by shared histories and collaboration. Intimate and often playful connection to materials, methods, and the confluence of art and theatre are likewise held in common. 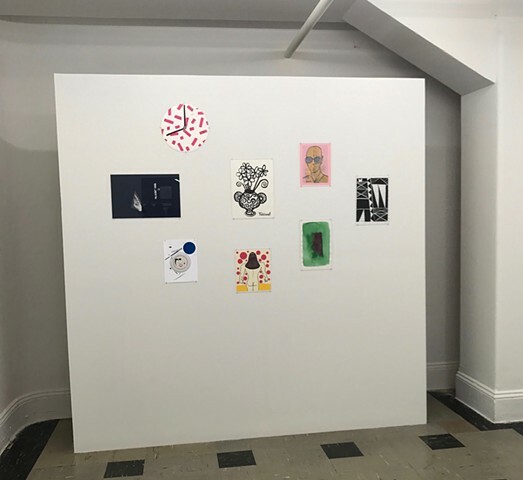 While symbols and forms serve as guides and unifiers, the show proposes an interplay of these narratives as both points of origin and as points of departure. "the form is stone, the dress is rain" is by May Swenson, from The Spine and the Cage, 1958 - Courtesy of the Literary Estate of May Swenson. 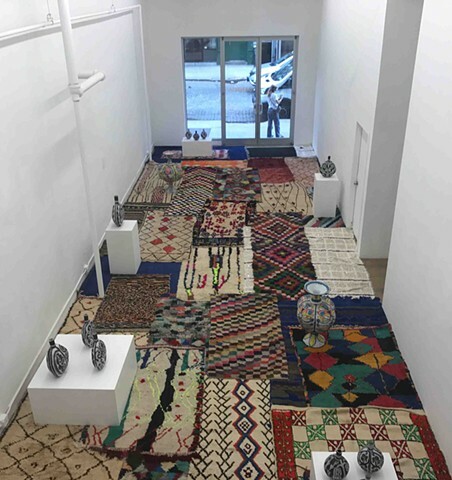 Magic Flying Carpets of the Berber Kingdom of Morocco, and an Elisabeth Kley Ceramic Anthology. 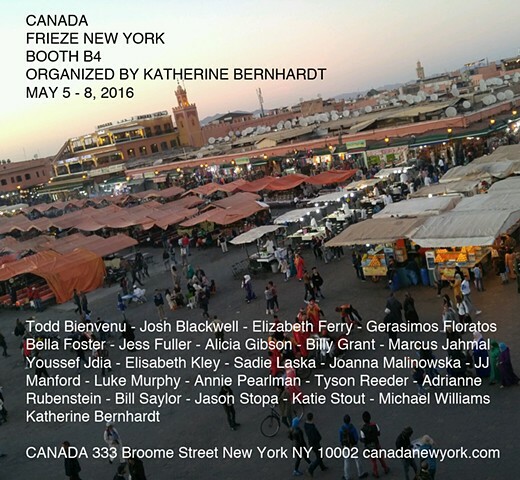 Lisa Anne Auerbach, Judie Bamber, Amy Bessone, Andrew Brischler, Zoe Buckman, Willie Cole, Mike Davis, Lecia Dole-Recio, Judith Eisler, Alexandra Grant, Keith Haring, David Haxton, Nir Hod, Timothy Horn, Elisabeth Kley, Kelly Lamb, Bovey Lee, Michael Manning, Maynard Monrow, David Mramor, Yuval Pudik, Dean Sameshima, Tabboo!, Betty Tompkins, Marnie Weber, T.J. Wilcox, and Rob Wynne. 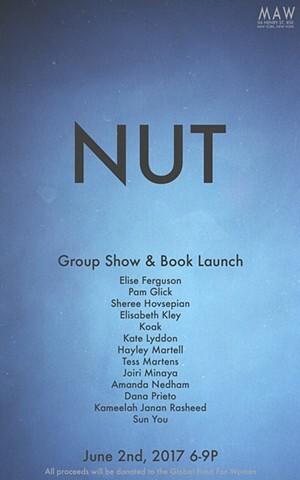 NUT is an all women’s publication devoted to celebrating and fostering the female artist community. 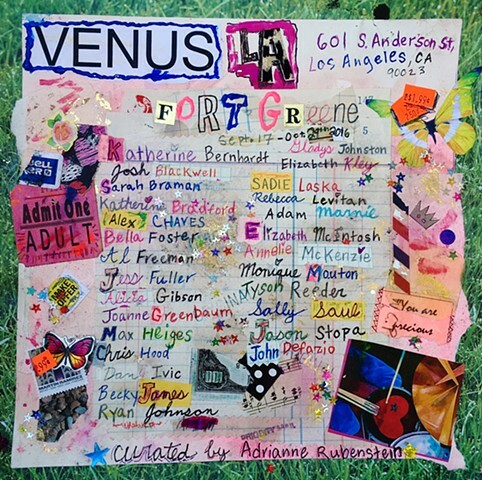 57 works on paper by women artists compose the first volume. Through the donation of 100% of book sale proceeds to the Global Fund for Women we hope to help alleviate women’s adversity in a small way. In addition to the initial press of 300 volumes available for purchase at the gallery, 50% of proceeds from artwork sales will also benefit the Global Fund for Women. 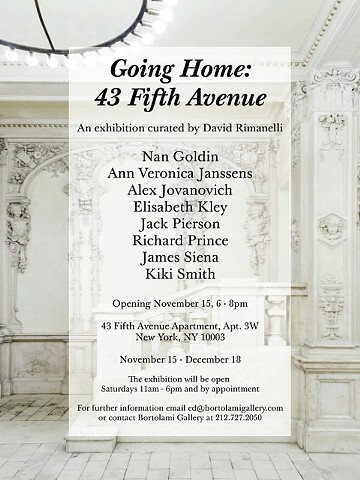 University Galleries is pleased to announce a new exhibition curated by internationally renowned artist Jack Pierson. 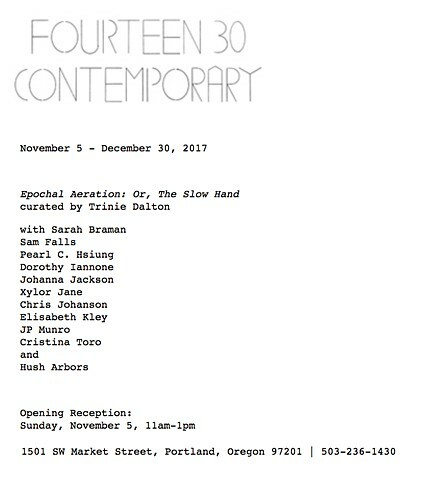 First conceived as a publication, the third volume of which was recently released, Tomorrow’s Man has grown into a three dimensional iteration of the bulletin-board, idea mash-up found in the publication and includes many of the artists Pierson finds most interesting and thought provoking. Inspired by a midcentury male physique magazine of the same name, the exhibition Tomorrow’s Man includes artworks by Michael Bilsborough, Stephen Tashjian (Tabboo! 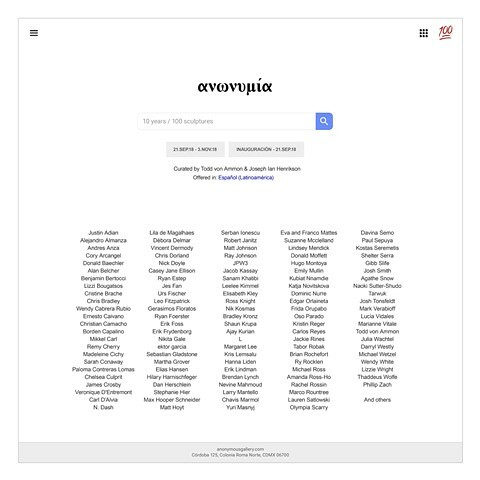 ), Laurel Sparks, Richard Tinkler, Florence Derive, Chris Bogia, Bryson Rand, David Dupuis, Jeff Davis, Andrea Zittel, Cali DeWitt, Shari Elf, Zak Arctander, Kembra Pfahler, Joe Sinness, Paul Sepuya, Elisabeth Kley, and Peter Fend. Canada is pleased to present "Ozymandias" a one-person exhibition by Elisabeth Kley. 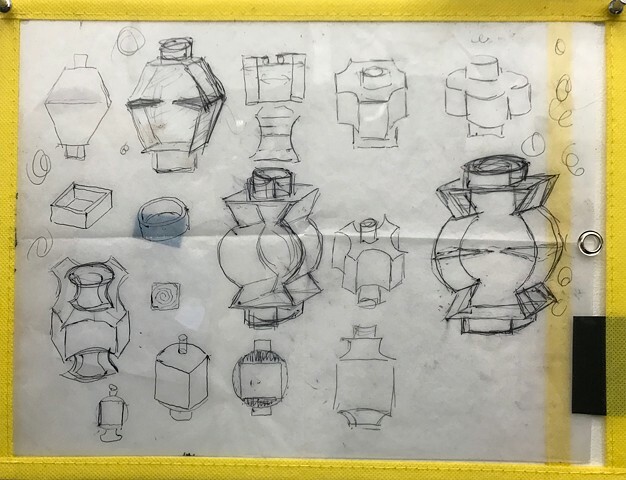 Ms. Kley's first solo show with the gallery will include works on paper, a wall painting, and ceramic pieces that refer to Weiner Werkstatte, Studio Craft and the history of excessive decoration. Kley takes her title from the famous Shelley poem of the same name about a ruined monument to a long forgotten despot. The poem is set in an unnamed strange locale and its themes include hubris and the inevitable decline of empire. It may seem apt, given the current political climate, to consider history as a series of blustery strongmen who naturally fall into the abyss of time. Kley, on the other hand, offers joy instead of pontification. Here we have unabashedly extravagant designs both mysterious and inviting, weightless manifestations of the past. 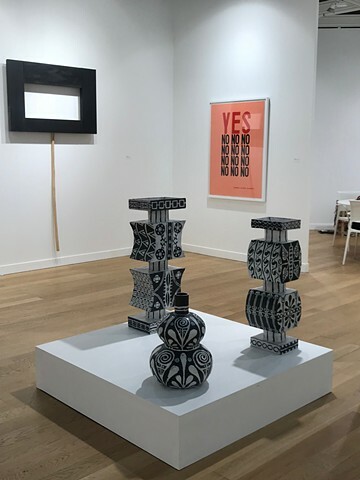 Kley’s current black and white ceramic vessels and drawings are inspired by Islamic, Byzantine and Asian historical ornaments and can be described as somewhere between all-over paintings and decorative sculptures. Repeated bold calligraphic patterns are filled with life giving symbols and designs including flower petals and leafy tendrils. The vessels are made from hand rolled coils and fired in an electric kiln in her studio. Decorations are applied using homemade underglazes with wax resist and sgraffito. The artworks are not only beautiful to look at but are also made with an artisan’s care and ingenuity. Dripping glazes reveal an appealing unfussy temperament, and forms sometimes seem to imply bulbous fruits like pomegranates or flowers. Although she sometimes renders traditional motifs directly, Kley’s works are rarely strict copies. Instead, they are personal inquiries into visually pleasurable shapes, colors and patterns. Each piece is unique, but also seems to be part of a larger whole. Translucent threads of dawn brings together a selection of Elisabeth Kley's ceramic cages with Conrad Ventur's photographs of the underground film star and performer Mario Montez. Kley's flamboyant, yet menacing cages incorporate a range of ornamental motifs--from Chinese and Persian to the Victorian era. The exuberant sheen of the colored glazes adorns only the outside of each cage leaving the interior with a rough, raw clay surface, creating two visual worlds within one object. While the cage is inherently an object of exclusion, in Kley's cage's interior and exterior are in constant conversation, creating a complex persona that embraces multiple psychologies of space and display. Ventur's intimate portraits of Mario Montez, who starred in seminal films by Jack Smith and Andy Warhol in the '60s, were made after Montez reemerged into the art world after a 35 year hiatus. Staging scenarios with Montez sometimes dressed as past characters from films such as Smith's Flaming Creatures (1963) and others, Ventur's photographs present a fluid approach to archiving the activity of a timeless performer. For Ventur, Montez is "collaborator, drag mother and gay grandfather—all in one," and like the screen-test (a form that Ventur has also worked with), these images portray a subject whose character cannot be confined by a single identity or static image, but will always transcend the medium through their performative spirit. 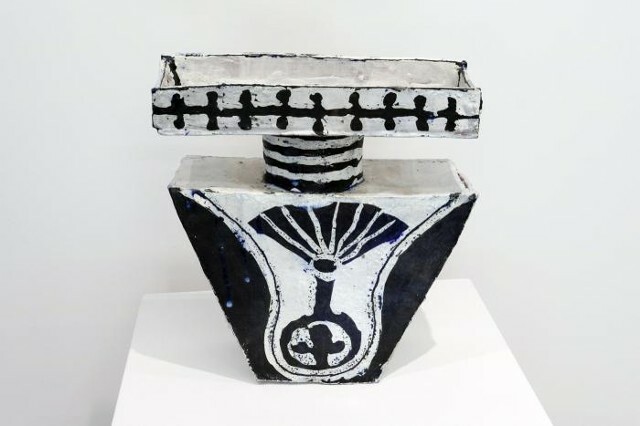 GAVLAK Palm Beach proudly presents "A Sign of Eternal Beauty," an exhibition of new works by two accomplished and under-recognized artists, Florence Derive and Elisabeth Kley, showing together for the first time. 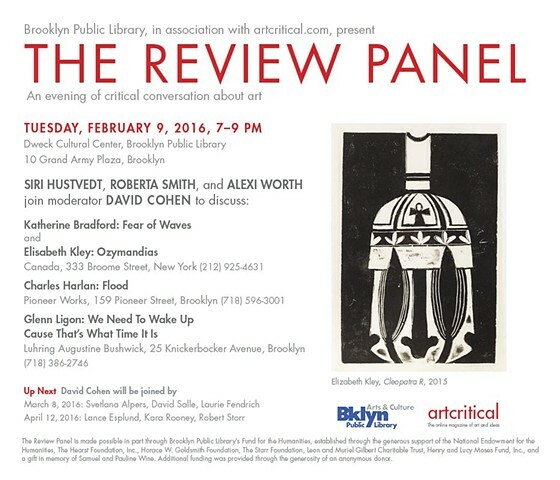 The show will include paintings, ceramics, and works on paper. 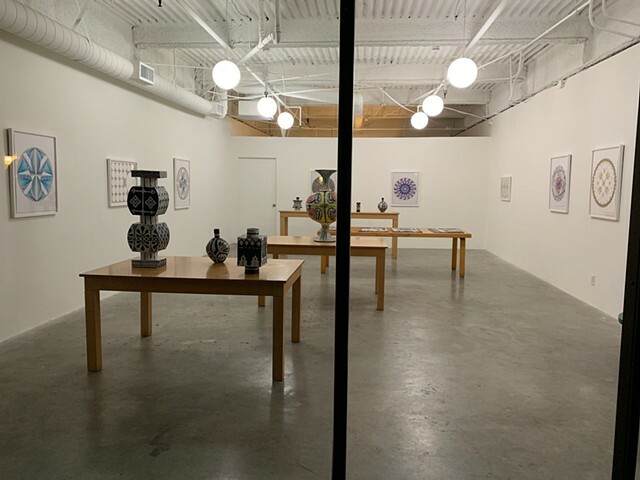 The title of the exhibition stems from Jack Pierson's 2013 poem inspired by Derive's paintings and persona, and it unites with Elisabeth Kley's shared dramatic sense of gestural flourish employing shape and color motivated by natural forms. 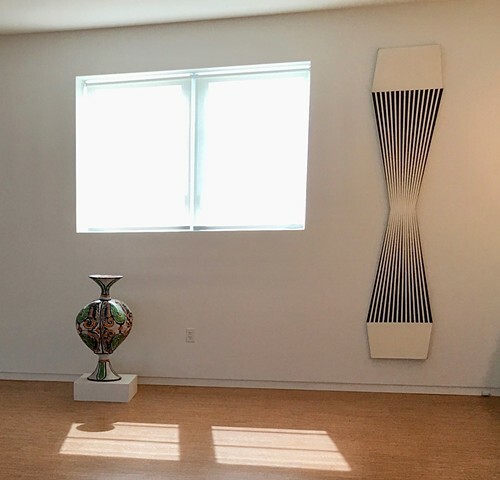 The artists paired here find voice separately represented by a grouping of entirely singular images and sculptures, while simultaneously engaging in a command of expression about repeat pattern and divergence, seasonal change, and the timelessness and power of voluptuous color. Work on view and available at NADA New York 2014 in booths of Season and Regina Rex. Kley will present a selection of her painted ceramic pots and drawings that exemplify her interest in drag culture and extravagance. Depicted in vivid colors, her ceramic pieces reference Gothic ornamentation, Islamic, Roman and Byzantium styles, and thus resemble ceremonial vestiges. One highlight is her drawing Large Ethyl Eichelberger that captures the flamboyant essence of American drag performer Ethyl Eichelberger in an elongated and dramatic form. John Tevis is pleased to present an exhibition of new work by Elisabeth Kley, The Queen’s Feathers, from 7 March through 7 April, 2012. 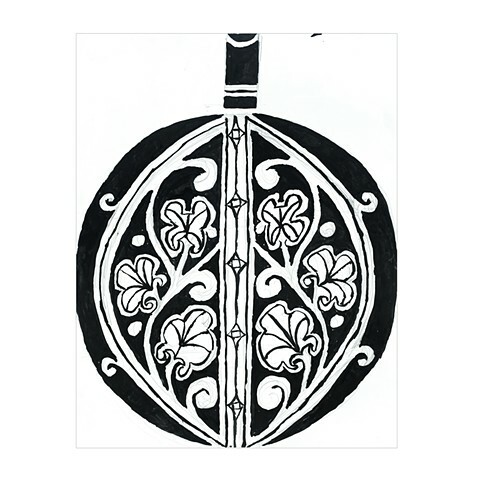 The gallery will exhibit six hand-inked prints by Elisabeth Kley. These works are rubbed and printed on Japanese and Thai paper using a series of plates made from Styrofoam into which the artist has drawn, cut and gouged her images of peacocks. Kley’s interest in the spectacular costume of these male animals evolved from her interest in drag as an extreme transformation. Unfolding their tails, peacocks undergo a metamorphosis akin to that of a man who changes his everyday appearance to become a fabulously artificial version of a woman. 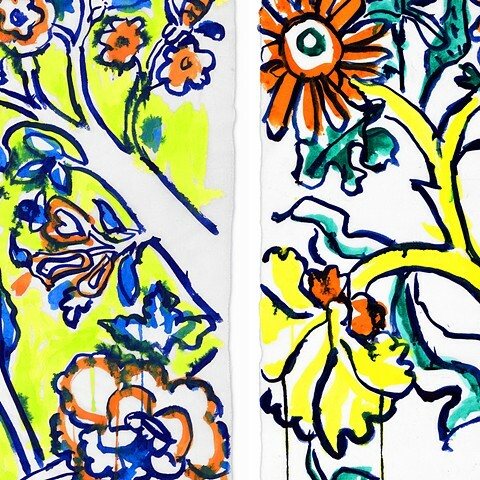 Designed to theatrically accessorize the domestic interiors of a flamboyant world, the artist’s prints are made for fantasized homes that could belong to the aging dandies she has drawn for years, including Salvador Dali, Erté, Coco Chanel, Elsie de Wolfe, Jack Smith, Ethyl Eichelberger and Candy Darling. 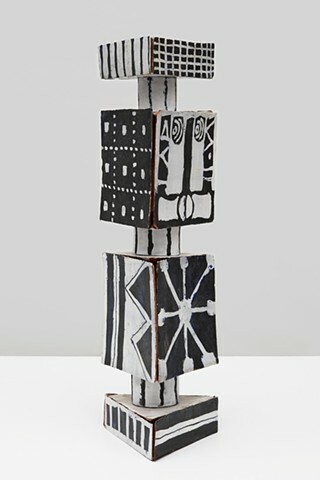 CERAMICS BY ELISABETH KLEY AND PAINTINGS BY SHANNON MCCONNELL. 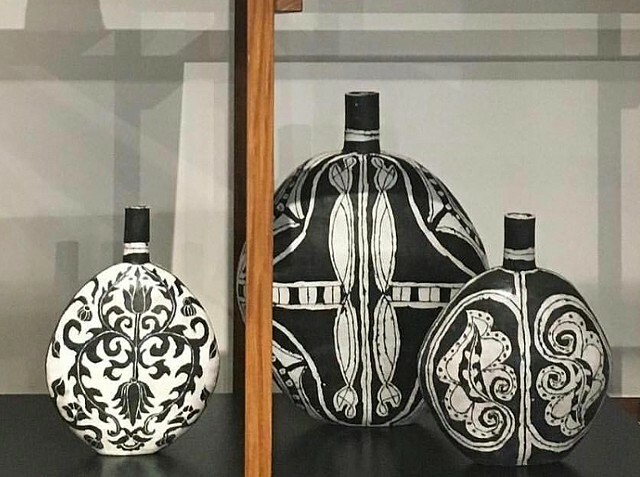 ELISABETH KLEY CREATES CERAMICS THAT ARE OTHERWORLDLY AND EVERYWORLDLY. ROMAN, ISLAMIC, MEXICAN AND BYZANTINE STYLES, ALONG WITH OTHERS, MINGLE IN HER WORK TO PRODUCE FANTASY IMAGERY THAT DEFIES TIME AND PLACE. FINE ART AND DECORATIVE ELEMENTS FROM VARIOUS PERIODS ARE FILTERED INTO NEO-MAJOLICA, DESTINED TO FURNISH THE INTERIORS OF A FLAMBOYANT WORLD INHABITED BY DANDIES AND FOPS. ELISABETH’S LINE-WORK MIMICS WROUGHT IRON AND SERVES DOUBLE DUTY AS IT BECOMES FRAMES FOR DOZENS OF EYES. “Oh help me heaven,” she prayed, “to be decorative and to do right!” Ronald Firbank. Firbank’s titles alone -Vainglory, The Flower Beneath the Foot, The Princess Zoubaroff, Concerning the Eccentricities of Cardinal Pirelli, evoke a carefree, more stylish time. As E.M. Forster said of Firbank, "It is frivolous stuff and how rare, how precious is frivolity!" 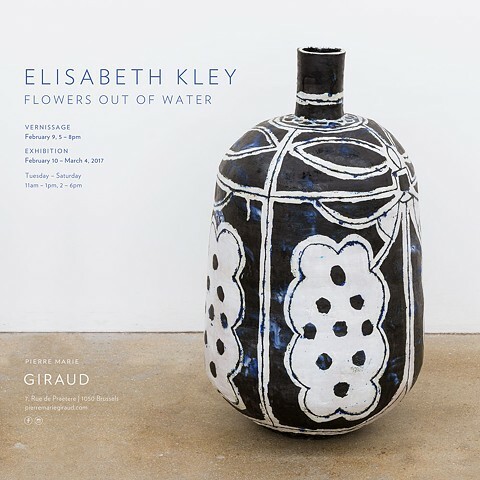 Momenta is pleased to present Elisabeth Kley's first solo exhibition. This extensive and ambitious exhibition traverses drawing, ceramics, and video to present an exotic world of extravagant personalities and architecture. 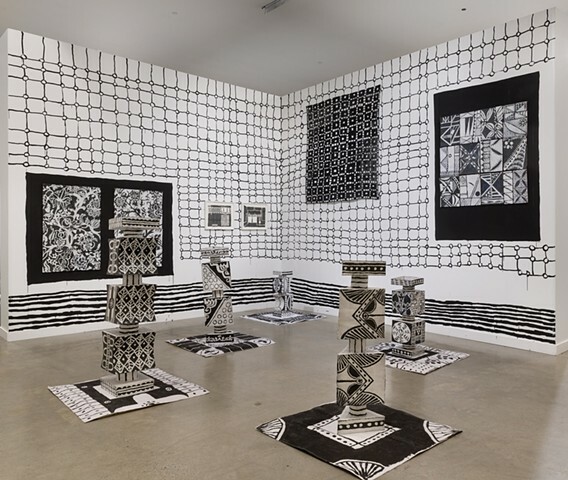 Pencil and ink collaged portraits, drawn and ceramic pavilions, fountains, and peacocks, and a video of a drag performance combine to construct a baroque, enveloping environment. 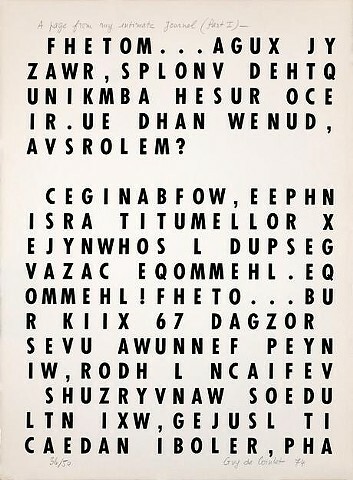 Very Cute for You, essay by Elisabeth Kley published in Tabboo! The Art of Stephen Tashjian, edited by Lia Gangitano, the first monograph on the legendary underground painter, puppeteer, performer. Tabboo! 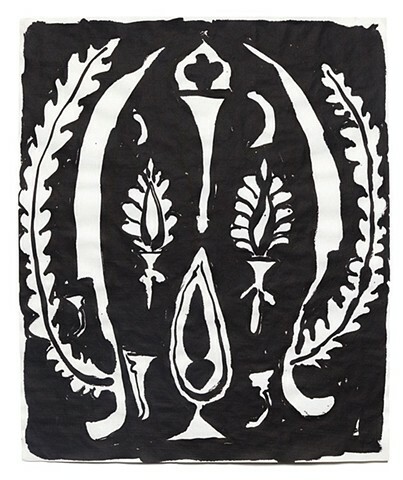 's Fairy Tale Renaissance, essay by Elisabeth Kley published in Dead Flowers, catalogue of a 2010 exhibition curated by Lia Gangitano at Vox Populi, Philadelphia and Participant Inc., New York.